By Sia in Social Media. Updated on December 9, 2017 . Many Facebook users are probably aware of the fact that the social network service has some form of image recognition technology under the hood. After all, this is how Facebook is able to suggest the right friends in which to tag your photos with. Tagging friends aside, did you know that Facebook’s image recognition technology also helps them tag your photos with specific parameters? If you’re interested in looking at those tags yourself, here’s how you can access them. On the Facebook website, open an enlarged version of a photo. If you’re on Google Chrome, right-click on the image and select Inspect. If you’re on other browsers, open up the browser’s Developer Tools. 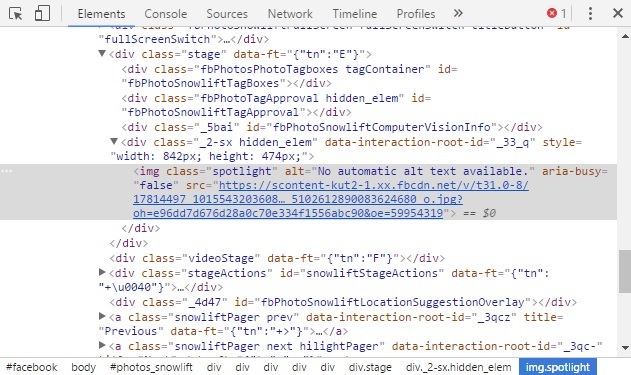 Search for the "alt attribute of the image tag" in the Developer Tools. Once you’ve managed to find the image’s alt attribute, you’ll be able to see all of the tags that are associated with the picture past the phrase "Image may content". For the most part, the tags associated with the photos are rather accurate. That being said, the image recognition system doesn’t seem to work well with pictures that aren’t photos such as pictures and screenshots. In these cases, there is a chance that you’ll see this rather than image tags instead. 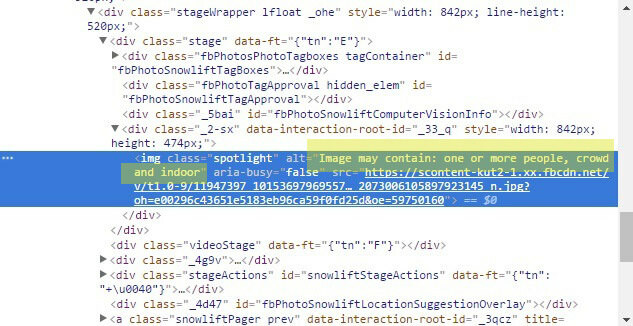 For those of you who would like these tags to be more visible, Chrome has a handy extension that lets takes the tags and makes it visible on the photos themselves.